Lushootseed Family Nights are Tuesdays and Thursdays during the month of March. This 8 class series will focus on canoe terms, dialogue, introductions, speeches and prayers. All ages are welcome, please be sure to RSVP so we can have enough food and materials for all participants. 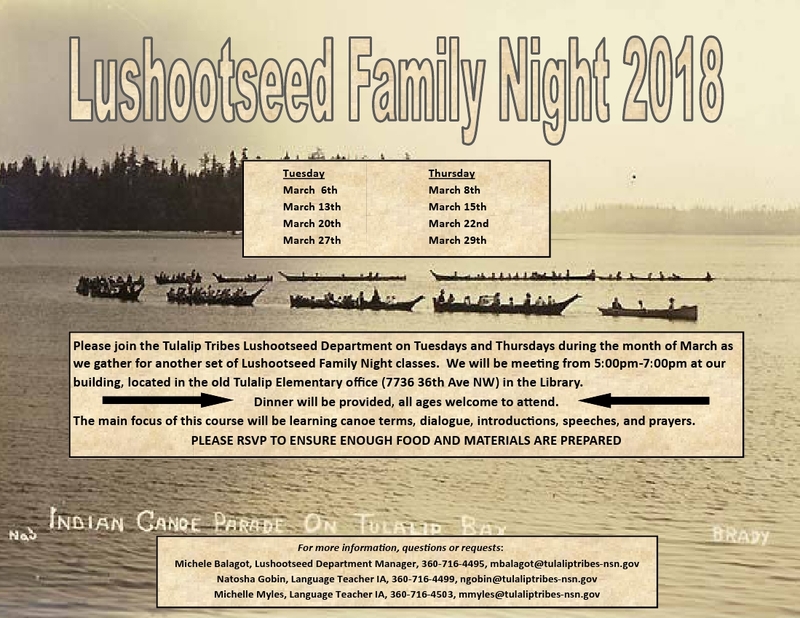 Family Nights will be held in the Lushootseed Building, located at 7736 36th Ave NW (Old Tulalip Elementary Offices), meeting in the Library. This entry was posted in Education, News, Tulalip News and tagged Family Nights, Lushootseed by Kim Kalliber. Bookmark the permalink.